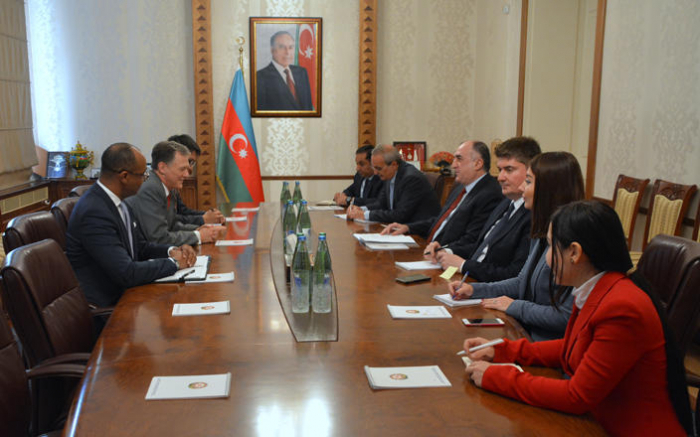 Azerbaijani Foreign Minister Elmar Mammadyarov has received US Deputy Assistant Secretary of Bureau of European and Eurasian Affairs George Kent, the Azerbaijani Foreign Ministry said in a message. During the meeting, gratification with the successful development of bilateral cooperation in political, economic, energy, transport and other fields was expressed. The importance of increasing efforts to further intensify bilateral relations was also stressed. The minister spoke about important energy and transport projects being implemented with the initiative and with the participation of Azerbaijan, in particular about the Baku-Tbilisi-Kars railway and the Southern Gas Corridor. In turn, Kent said that the US continues to develop bilateral relations with Azerbaijan in energy, security, economy and others. He also stressed that Azerbaijan’s contribution to peacekeeping operations within the fight against terrorism is appreciated. The Azerbaijani foreign minister spoke about the current negotiations on the settlement of the Armenia-Azerbaijan Nagorno-Karabakh conflict and his meeting with the Armenian foreign minister in New York mediated by the co-chairs of the OSCE Minsk Group. Mammadyarov stressed that the violation of internationally recognized borders of a country by using force is unacceptable. During the meeting, views on other issues of mutual interest were exchanged.